The Pat Dolan Trail (previously Willow Lake Trail) is a path winding through Flushing Meadows-Corona Park. It goes around Willow Lake, the smaller of the two lakes in the largest park in Queens. Renamed after Patricia Dolan, the founder of the Flushing Meadows-Corona Park Conservancy, it is an area seeking to embody the untouched wilderness. It begins on the west side of Flushing Meadows Park in Forest Hills, and curves its way around the south bend of Willow Lake, opening up at the east side of the park. Both neighborhoods are quiet, residential areas with the conveniences of urban neighborhoods. The closest transportation is the 75th Avenue Subway Station on the Forest Hills side, offering the E and F trains. The Pat Dolan Trail is a bizarre path marked with wide, neat areas for comfortable hiking and overgrown patches of land covered by black trash bags wet with odd substances. Some areas are neatly trimmed, lined with tall plants and offering a view of the lake and its vegetation. Other areas are wet with unidentifiable substances, a line of unstable tiles offering the only unstained ground to walk on. These areas are often overgrown with surrounding plants, making it even more difficult to hike through. One area like this is shown in an image taken by Curbed New York. The ground is wet with an orange liquid, and a line of uneven wooden rectangles are the only way to pass through without stepping in sludge. Further up the path, a cramped, overgrown area is visible. However, the trail is also fairly deserted, and the quiet nature that surrounds the path is worth experiencing. Another example of this is in a photo taken off of a bridge that goes through the trail. The bridge, on the bottom of the image, is dilapidated and falling apart, an indicator of how neglected the Pat Dolan trail has become. However, the vegetation surrounding the trail and the water are healthy and provide the view of nature the trail strives to deliver. Though the trail is in desperate need of maintenance, it is still beautiful in some areas. However, the segments of the trail lacking in beauty need to be fixed. Based on the substances found in some parts of the trail, water near the path most likely needs to be treated in some way. The soil needs to be fixed up so that it is not a hazard to walk on, and plants around the path need to be trimmed back. The bridge needs to be reconstructed and the rotting wood should be replaced. This cannot be done without labor. Although there are no volunteering programs for the Pat Dolan Trail specifically, there are multiple opportunities available for Flushing Meadows Park. The Alliance for Flushing Meadows Corona Park is accepting volunteers who contact them. In addition, the City Parks Foundation’s “It’s My Park” program is available for those who want to start projects to help out parks — this is one way the Pat Dolan Trail itself can get the maintenance it needs. Despite the possibilities for renewal, the Pat Dolan Trail has stayed the same for years. It is one example of how parks can fall into disrepair, neglected for newer spaces in NYC’s extensive park system. It is necessary for all green spaces to have park departments and volunteers willing to organize events and work to maintain sites, especially in the outer boroughs. The Pat Dolan Trail is an example of the potential in every park, potential that cannot shine without people to make something of it. 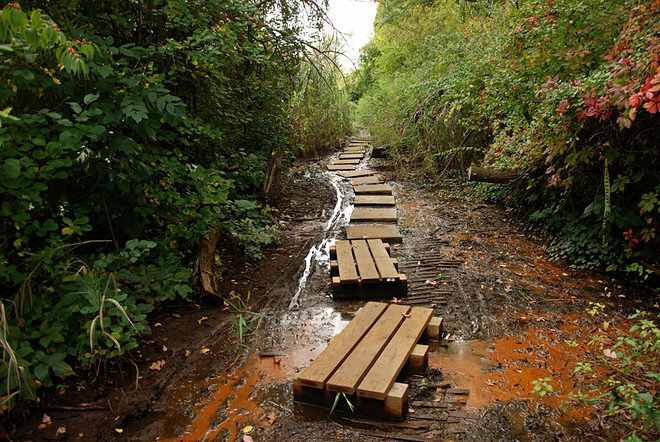 A photo from Curbed New York shows the contamination in the trail.